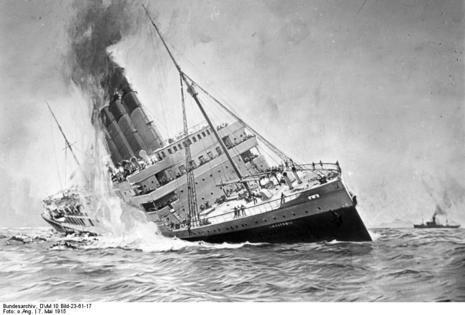 On May 7, 1915, the German submarine (U-boat) U-20 torpedoed and sank the Lusitania, a swift-moving British cruise liner traveling from New York to Liverpool, England. Of the 1,959 men, women, and children on board, 1,195 perished, including 123 Americans. 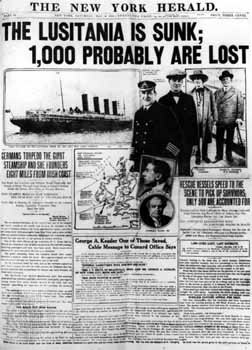 A headline in the New York Times the following day—"Divergent Views of the Sinking of The Lusitania"—sums up the initial public response to the disaster. Some saw it as a blatant act of evil and transgression against the conventions of war. 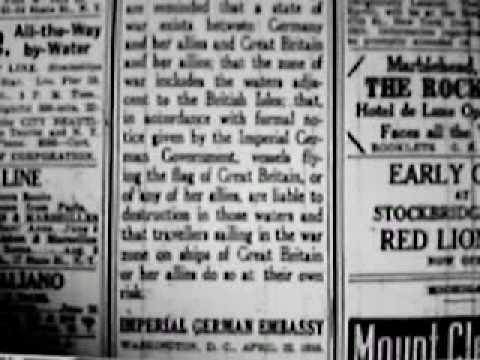 Others understood that Germany previously had unambiguously alerted all neutral passengers of Atlantic vessels to the potential for submarine attacks on British ships and that Germany considered the Lusitania a British, and therefore an "enemy ship." President Wilson Warns Germany She Will be Held to "Strict Accountability"
The whole civilized world was horrified to learn, on May 7, 1915, that the Cunard Line Steamship Lusitania, bound from New York to Liverpool with 1959 persons aboard, of whom 179 were Americans, had been torpedoed off the southwestern coast of Ireland and 1198 lives lost. The toll of death included 114 Americans and 35 infants. Many persons of distinction went down with the Lusitania, including Alfred Gwynne Vanderbilt, Charles Froh- man, Charles Klein, Elbert Hubbard," Justus Miles Forman, and William T. Stead. Nine days before the time set for the sailing of the Lusitania, all the notable Americans who had booked passage on the ship were warned by anonymous telegrams to cancel their engagements. A further warning appeared on the day the ship sailed, in the form of advertisements in the New York dailies, giving notice to neutral travelers that the Zone of War included the waters adjacent to the British Isle and that all vessels flying the British flag were liable to destruction in those waters. To counteract this threat, the agent of the Cunard Line assured the passengers that no danger need be apprehended. Very few of the passengers canceled their bookings. So the Lusitania was permitted to steam out of New York Harbor on the appointed day. All went well until 2 o'clock on the afternoon of May 7, 1915, when the Lusitania, then some ten miles off the Old Head of Kinsale, the most southerly point of Ireland, sighted a submarine. Without warning, torpedoes in quick succession struck the ship, crashing through the hull and opening a large cavity through which the water entered. Many seamen were killed outright or injured by the explosions. Boats were lowered in haste, only to capsize in the placid sea. The listing of the ship increased the work of rescue. Wireless calls for aid brought many naval vessels and other ships to the assistance of the doomed ship. One of these, the Narragansett, received the call while dodging two submarines which fired upon her as she speeded on her errand of mercy. The steamer Etonian was prevented from answering the call by a warning that she, too, might be attacked. 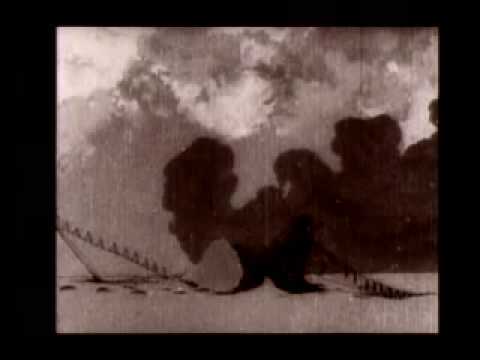 Eighteen minutes after being struck, the Lusitania went down, Captain Turner still standing upon the bridge. He was afterward rescued. Women and children were given priority in the boats, but in the excitement, several boats were overturned. The Americans, without exception, died heroically, assisting the women to places of safety in the boats. The German Government hastened to justify the crime, by the false assertion that the Lusitania was in reality an armed munition ship. This mendacious claim was met by the proof that the Lusitania carried no guns, either mounted or unmounted, and the only munitions in her hold were 1250 shell cases and 4200 cases of cartridges adapted for small arms. A coroner's jury, at Kinsale, Ireland, charged the Emperor and the Government of Germany with "the crime of wholesale murder before the tribunal of the civilized world." Six days after the sinking of the Lusitania, President Wilson, in a communication to the German Government, declared that "American citizens act within their indisputable rights, in taking their ships and in traveling, wherever their legitimate business calls them upon the high sea." He recited the series of outrages perpetrated by Germans in which American lives had been jeopardized; called upon the German Government to "disavow the acts of which the Government of the United States complains," and warned the German Government that the United States would omit no word or act necessary to the performance of its sacred duty of maintaining the rights of the United States and its citizens, and of safeguarding their free exercise and enjoyment. Finally, the President warned the German Government that he would hold it to "a strict accountability" for any infringements of the rights of American citizens, intentional or incidental. 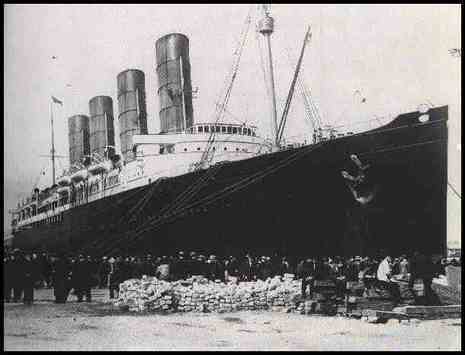 The German Government, on May 30, 1915, pleaded extenuation for the crime by reasserting the falsehood that the Lusitania carried munitions of war and was probably armed. President Wilson replied vigorously, demanding assurances that Germany would refrain from conducting submarine warfare upon unarmed passenger boats. Germany pretended to agree to this proposal. The American Secretary of State, William Jennings Bryan, was so shocked at the belligerent tone of President Wilson's warning to Germany that he resigned and Robert Lansing was appointed his successor. Lindley M. Garrison, Secretary of War, also resigned from the President's Cabinet, because his views on war preparedness did not coincide with those of the President. Newton D. Baker of Cleveland, Ohio, was chosen to succeed him. President Wilson resumed negotiations with Germany, looking to a settlement of the damage claims for loss of life on the Lusitania. On February 8, 1916, Germany promised to make due reparation for the wholesale murders committed, and was almost constrained to admit that the sinking of the Lusitania was a crime. A week later, however, the German Government reopened the rupture by declaring that all armed merchantmen of an enemy nation would be regarded as warships and be subject to attack without warning. While these parleys were in progress, on March 24, 1915, the passenger steamship Sussex was torpedoed without warning in the English Channel. President Wilson, in despair of ever recalling the German admiralty to a sense of humanity, demanded that the ruthless methods of naval warfare cease at once on pain of the instant rupture of diplomatic relations. The continuance of this parley belongs to a later period of the war story.